An unexpected error has occoured while trying to add the product to your shopping cart. The administrator has been notified. Please try again later or contact sales department for ordering. After you select Brand, Year, and Model; mouse over the display for controls to Zoom, Save, or Print the document. Not all parts manuals are currently available. If your model is not listed, please email us at support@aomc.mx and we will assist you in finding the part you need. 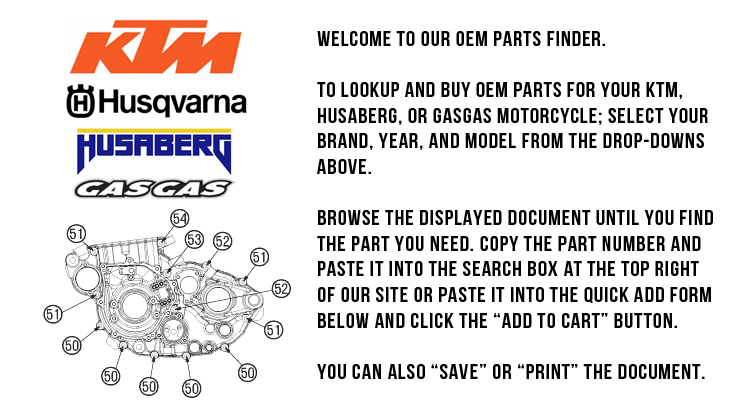 OEM Parts Finder Catalog uses Adobe® Acrobat® PDF. Use this form to quickly enter your part numbers from the pdf manuals above. Beta parts must have dashes in correct place. *Caution! This form does not support superseded part numbers! Please check your numbers for accuracy and make sure they are the most current part numbers available (not superseded). Any superseded items will be canceled from your order. This website is not maintained by KTM North America, Inc. KTM Products and the corresponding article numbers that KTM North America, Inc. recommends for a particular application may change from time to time. This website may not have the most current article numbers. The best way to be sure you have the latest and best KTM Product for your KTM is to contact your dealer directly. The copyrights to the materials displayed on this site belong to KTM North America, Inc. In viewing this website you agree that you will download and print the information contained therein for your personal use only. By ordering in reliance on the information on this web page, you agree to use the information for your personal use only. In addition, you agree not to hold KTM North America, Inc., its employees, representatives, officers, directors or agents responsible in any way for damage or injury that is caused in whole or in part by your reliance on the information found on the following pages.